Bongkotkarn graduated from the Nursing Faculty of Chiang Mai University. She has almost 4 years of Pediatric Intensive Care Unit experience at the Maharaj Hospital and almost 10 years at the Lanna Hospital. 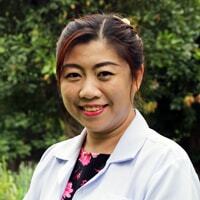 Her long time of nursing experience and compassion make Bongkotkarn an integral part of the team delivering quality care to all our clients at Cabin.